All aboard the Jolly Rocker! The Jolly Rocker is a large swinging pirate ship ride, which made its debut at Legoland Windsor with the opening of the Pirates’ Landing area in 2010. The ride, fashioned after a giant pirate ship, seats up to 35 people at a time. The boat swings back and forward in a pendulum motion, eventually becoming almost vertical at the extremes of the swing. Riders in the very back rows get some superb pops of airtime, with the feeling of literally floating out of their seats. Although new to Legoland in 2010, the ride is actually second hand, having been moved from Heide Park in Germany (apparently somehow they accidentally ended up with two pirate ships). Not that you would know it – the ride’s bright red and yellow Lego brick theming is superb! Pirate ships are usually high capacity rides, but unfortunately Jolly Rocker’s loading procedures are torturously slow – they require an adult to be seated on the extreme ends of every row of five people. This seems to involve a lot of shuffling around and huffing of parents being told they need to sit with a stranger’s children to get the right people in the right place. Sometimes it can take five minutes or more just to load the ship! 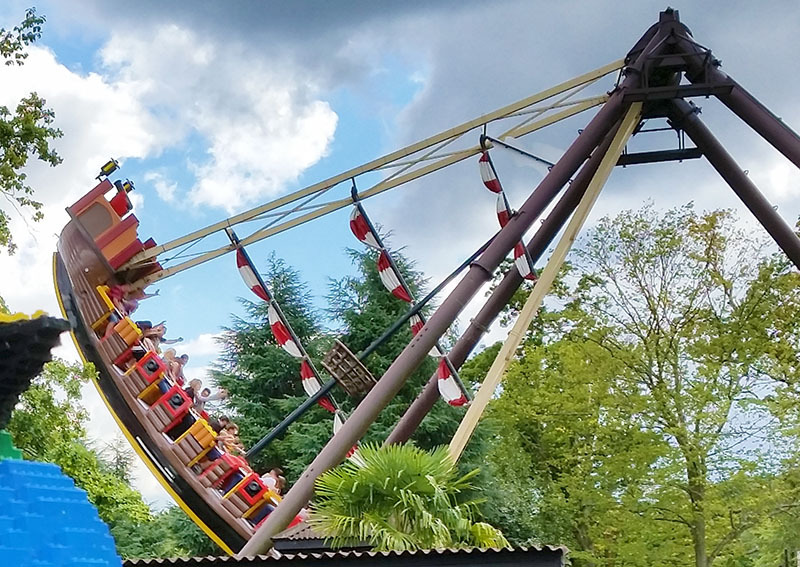 Aside from the ludicrous batching, Jolly Rocker is a fantastic ride – it’s among the best pirate ships in the UK and a real Legoland highlight.